Six Year 6 individuals took to Littledown 3G pitches on Wednesday 23rd January 2019 on a cold and frosty morning. 8 schools from across East Dorset took part in the tournament and all schools were split into two groups with the top team from each group playing in a finals game. Ferndown Middle School won their group by winning the first game 5-1, second game 7-2 and the third game 2-0. The boys met with Christchurch Juniors School in the finals game. Ferndown Middle school took kick off and looked very nervous with Christchurch pouncing on this and making a couple of attempts on goal. However, our defenders were quick to switch on and played the ball well from the back. A couple of link up plays between the midfield led the striker to impose a threat on the Christchurch defence allowing a couple of near miss opportunities, however, both teams couldn’t find the back of the net in the first half of the game. In the second half Ferndown Middle School were quick to try and put Christchurch under some pressure with some clear and accurate passing in the midfield and defence to build up an exceptional play towards the attacker who beat his defender to make a run. He entered the penalty area to slot the ball middle left passed the keeper. Ferndown are now 1-0 up with 4 minutes left to spare. Christchurch were not going to give up with a couple of unbelievable plays that led with the attacker striking two deadly shots towards our keeper who made two tremendous saves to keep Ferndown in it. The final whistle blew and the Year 6 Ferndown 6 a side team now progress to the finals day of the competition. The boys played in exceptional spirt and sportsmanship all contributing to winning the tournament. After progressing through the first round of the Schools competition against Allenbourn the boys took part in the Dorset Schools Final at Dorset Cricket Centre on 24th January 2019. Three schools took part including Ferndown Middle School. These were St Michaels Middle and Sir John Colfox Secondary School. The boys were first up against Sir John Colfox School. The toss was won by SJC and they decided to bat first. They posed a tough score of 89 off 7 overs for a loss of 2 wickets. Our boys came out with the two openers setting a good foundation. However, in the second over one of our batsmen got bowled a great Yorker that went under his bat to be bowled. The boys started to build again by keeping the run rate moving on steadily. Henry retired in the fourth over and our batters soon started to fall short of the rate with some good bowling and fielding that led to a collapse in the batting order. Henry came back in but was shortly run out in the last over for 28. FMS were all out for 78. The Second game proved to be more challenging for the Year 7 Cricketers with St Michaels posting a score of 105-0 off 7 overs with all of their batters showing exceptional discipline and placement within their batting. However, our boys decided to not give up and came out with great intent to attack this score. The openers started off well by putting the bowlers under pressure by going at 15 an over with some great shots off the side walls. Henry connected with a great shot to hit the back wall to bring up FMS first 6 of the competition. Although, after a mix up in the running between the wickets we lost our first opener for 45 off 3 overs. At this stage FMS were on track for a victory. Joseph and Henry pushed the score forwardly nicely by showing some fierce attacking power with the bat and making some quick runs between the wickets. At 5 overs in FMS were 70-1. However, St Michaels brought back some fierce bowling and broke through our batters leading us into the 6th over 78-5. In our last over the boys gave it their all and ended their innings on 90-5 off 7 overs. Congratulations to St Michaels and Sir John Colfox for your victories. 13 year 5 and year 6 children from Ferndown Middle School took part in the East Dorset swimming gala at Canford Schools Leisure centre. They took part in a selection of swimming races over a four hour event. They competed against 8 schools across the East Dorset area. They all gave 100% in each race with some year 5 and 6s finishing first and second in the backcrawl and breaststroke 50m races. We finished 7th in the competition. It was a great experience of the year 5 and 6 swimmers showing great determination and dedication to give it their all in each swimming event. On Thursday evening our year 8 netball team were finally able to play a league game, following numerous cancellations due to the good old British weather! 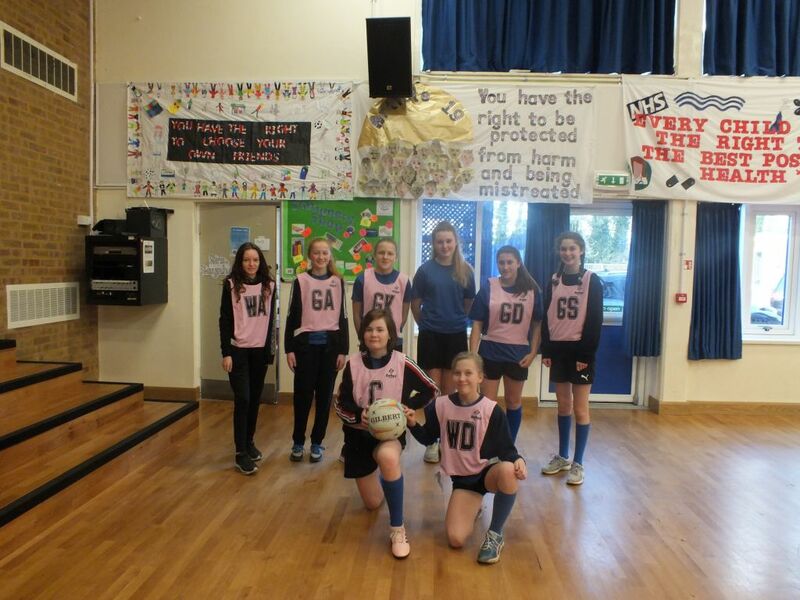 The girls played two games, firstly taking on Allenbourn Middle School. It was a very evenly matched game in which Ferndown took an early lead. However, Allenbourn managed to equalise just seconds before half time. Despite both teams sharing plenty of possession, Allenbourn snuck the win with a second goal just before the final whistle. …Next up we faced Poole High. Despite our best efforts, where we once again had lots of posession, the Poole High shooters were simple fantastic and they went on to beat us 6-0. Although disappointed to have lost, the girls can be proud of their efforts – for 5 of the team it was their first game for our year 8 netball team. Well done girls! Copyright © 2015 Ferndown Middle School. Paper copies of any information on our website can be provided free of charge via the school office.